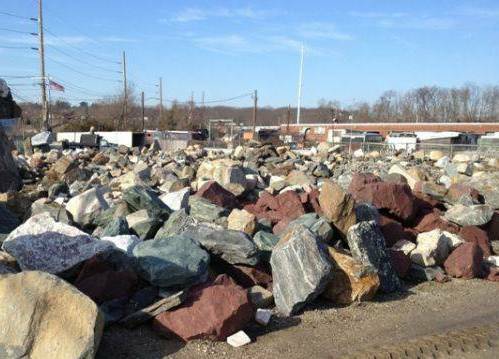 We have a Large Variety - In Stock - Year Round - of Landscape Boulders - Rocks - Stones on Long Island, please come see. Google or Bing Satellite pictures can show alot of what companies really stock compared to what they state they do, we do not want anyone to waste customer's precious time. 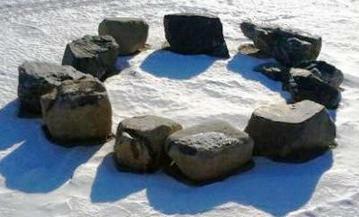 * Massachusetts Granite Boulders - Rocks, White with some Grey. Just give us a call before you make the trip to us. Use "Google maps" serching for "Skyview Stone", or follow directions on our websites. Skyview Stone on the Northeast corner of the 'Y' intersection. Please stop at local Donkin Donuts or 7-11 in town if you come a long distance and need facilities, as there is no bathoom facility to use at Skyview Stone location. We can put 1,500 lb rocks in place 30 feet from our truck, up close to where truck can park we can place 10,000 lb rocks. Our truck also has a cable winch on the boom, so we can lower items down in a hole or down a bank. Large Natural Long Island Landscaping Boulders and Rock Retaining Walls last a Long Time ! Generations from now let your great grandchildren say "That wall was built by my Great Granddaddy ...Solid just like my Family"!! Long Island Boulders, left over from the Glacial Till. They come to the surface on Long Island sometimes on their own, other times they must be brought to the surface to bask in the sunlight ! They have been sleeping in the rich sand of Long Island. We can deliver the size of LI Boulders you need. Some Long Island Boulders which are 3 ft. in diameter weigh approx. 3400 lbs. 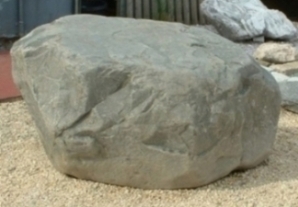 LI Boulders for your landscape come in different sizes and shapes, from beige to grey in color. 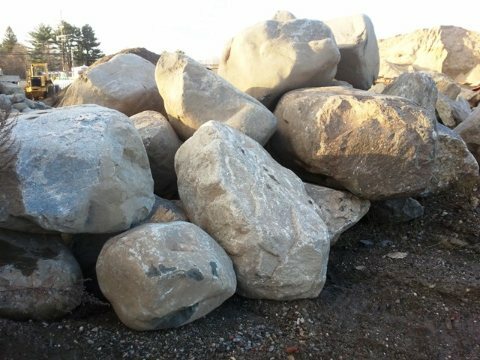 Long Island Landscape Boulders also comes in different sizes and colors in the range of brown, tan, off white, light and dark grey. 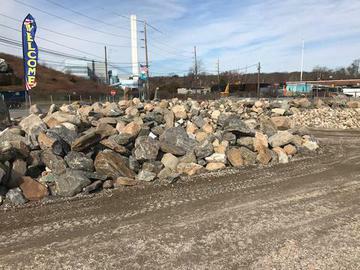 We can deliver Landscaping Materials like Long Island Boulders, Rocks and Stones to Suffolk County, Nassau County, Brooklyn, Queens, and Manhattan. Have a piece of Long Island Sound in your back yard! Natural Long Island Boulders are hidden in the sand on Long Island, left over from the Glacial Till ! Long Island Landscaping Boulders vary in Sizes range from 1 - 10 Feet in diameter. You can make Retaining Walls with these All Natural Specimens, which last a long long time! This LI Boulder is resting on baby LI Stone Pebbles. Long Island Stones we also carry in stock for you to view in our large instock Landscaping Supplies in Kings Park, Long Island, NY. Skyview Stone is located at the North East corner of Old Northport Rd & Townline Rd, on our 2 acre location. Our customers like to see large varieties of rock, stone, and boulders to compare colors, shapes, and sizes while they are present at our location. Decorative Granite Rocks, Landscaping Boulders, and River Stone comes in different colors, shapes, and sizes. Rock and Stone Supply for Suffolk County - Nassau County - Queens - Brooklyn - Bronx - Manhattan - NY City. Decorative Landscape Accent Rocks come in many different Colors, Shapes, and Sizes. Come pick out the Rocks for your Landscaping Property Project! 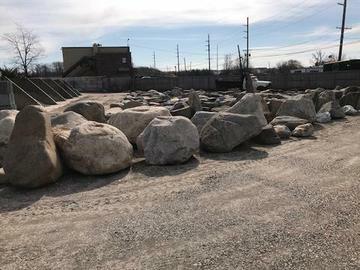 Landscaping Stone, Landscaping Rock and Landscaping LI Boulder, on Long Island, comes in smaller sizes for decorative landscaping or drainage gravel behind rock walls for property erosion management control. LI Boulder Delivery is available. Landscape Rock, Landscape Stone, Landscape Boulders can be delivered to Suffolk, Nassau, Manhattan, Queens, Brooklyn, Bronx, NY City. 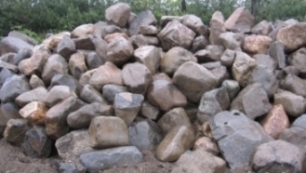 We stock a large Selection & Quantity of Rock, Stone and Long Island Landscaping Boulders at our location in Kings Park. If you do not see what you are looking for, give us a call and check to see if it also is in stock or readily available ! We sell Rocks for : Lakes, Ponds, Riverbeds, Streams, Waterfalls, Swimming Pool Diving, Borders, Backyard Landscaping Boulders, Natural Stone Retaining Walls, Rock Gardens, etc. Check out our other website for additional products: Skyviewstone.com. Let us know how we can help with your plans ! 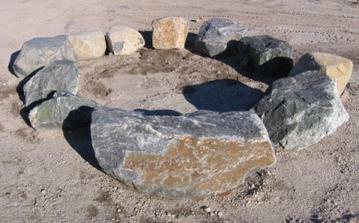 How about your Fire Pit encircled with Granite Rock Seats to absorb the heat and keep you warm ! Couple Rocks or Single Ride, rocks will keep you warm with your friends for sharing those fireside stories. You would not believe how old I am! I've come to the surface to meet you!! 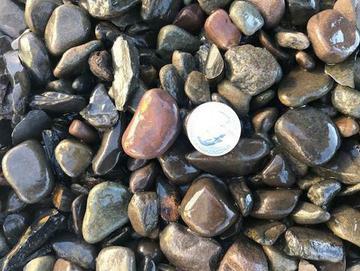 Adirondack Mountain River Stone 5" - 10" in size. Adirondack Round River Stone comes in 5 sizes : 1/2" , 1" , 1" - 2", 2" - 3", and Kobbles 5" to 10". Colorful Adirondack Mountains River Stone Crushed comes in two sizes : 3/8" - 1/2" and 3/4" - 1" size. Great stone for driveways, walkways, landscape design, river beds, waterfalls, and ponds. This Awesome Piece of Manhattan Granite Rock .... is perfect for a Beautiful Diving Rock, Grotto Rock, size approximately 8 ft x 2 ft x 4 ft.
How about you make a Rock Grotto, suspending this huge rock in the air like a Cave... with water cascading down into your Swimming Pool ? 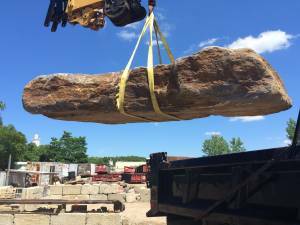 This Granite rock weighs 7200 lbs, and was just shipped to West Virginia to be a Diving Rock on a pool. Need your Rock or Boulder moved to a special loacation and be set just right....they way you like to see it ? We deliver to locations inn Suffolk County, Nassau County, Long Island, Manhattan, NY. Local delivery within 4 miles of us, with our small dump truck, is usually $60. If you need the rocks you picked out set in place, with no damage to surrounding area, then we use our Crane truck to get the project done. Decorative Rocks & Boulders, Large Rock Weighs 7600 lbs. 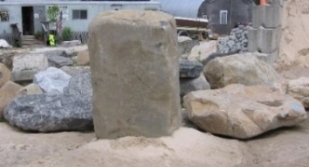 Large rocks can be placed at entrances and also be engrave with name and address. Or they can used as memorial monuments with plaques attached. They can we set in place with a boom truck. GPS Incorrect in our area, it will bring you 4 miles East of us at other end of the road. From the WEST - Take the Long Island Expressway EAST to EXIT 53 - Follow the service road to the SUNKEN MEADOW PARKWAY - you want to go NORTH (Kings Park). Take the SUNKEN MEADOW PARKWAY NORTH to EXIT SM4W - PULASKI ROAD. Merge onto Pulaski Road (west) and travel about 1 mile to the FIRST TRAFFIC LIGHT - TOWN LINE ROAD (bottom of the hill) . Turn LEFT onto TOWN LINE ROAD. Go under the Railroad Tressel and than (about 1/10th of a mile) you will come to a fork in the road where TOWN LINE ROAD and OLD NORTHPORT ROAD meet, turn left AT THE FORK into SKYVIEW STONE & BOULDERS ROCK LONG ISLAND. From the EAST - Take the Long Island Expressway WEST to EXIT 53 - Follow the service road to the SUNKEN MEADOW PARKWAY - you want to go NORTH (Kings Park). Take the SUNKEN MEADOW PARKWAY NORTH to EXIT SM4W - PULASKI ROAD. Merge onto Pulaski Road (west) and travel about 1 mile to the FIRST TRAFFIC LIGHT - TOWN LINE ROAD (bottom of the hill) . Turn LEFT onto TOWN LINE ROAD. Go under the Railroad Tressel and than (about 1/10th of a mile) you will come to a fork in the road where TOWN LINE ROAD and OLD NORTHPORT ROAD meet, turn left AT THE FORK into SKYVIEW STONE & BOULDERS ROCK LONG ISLAND. We are the West Exit from PKWY, if you go East from the pkwy exit, you will be driving through the town of Kings Park. On your right there is a 7-11 store, Dunkin Donuts on your left, and at RTE 25A (main street) you will see a Diner on the right and Park Bakery on your left. Stop for a drink and use the facilities if you've come a long way, because it is dry at Skyview Stone & Boulders Rock Long Island. 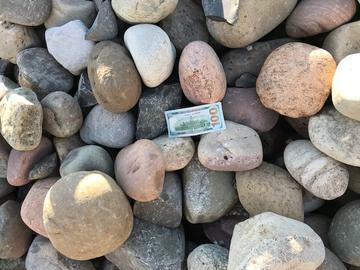 Skyview Stone is at least a mile to closest gas station or 7-11, those who need to please stop before arriving as there are no facilities on 2 acres to use.
" Let Us Rock Your World With Boulders "